We’d love your help. Let us know what’s wrong with this preview of Behind the Lens by Cassandra Giovanni. And he's ab Natalie Scott's life is simple with no strings attached. As a band photographer, she's made metal music her life, and life on tour means no relationships. To ask other readers questions about Behind the Lens, please sign up. Is this a Boys of Fallout book? In one place on goodreads it's listed as in that series, but on this page is in the Metal Life series. Cassandra Giovanni Yes, this is a Boys of Fallout book -- for some reason I can't get GR to update the information or change the cover. "All I can think is how hard I'm falling. And if I'll let him catch me"
Reading is a very personal process. Some books you will like, some you will hate. Some authors will have a direct connection to your heart. Cassandra Giovanni seems to be one of them for me. Every book she writes is a hit for me. I can always relate to the characters and I love the messages she delivers with them. Behind the Lens might be the best demonstration of her work so far. If you love stories about people overcoming their past and their fears in order to become who they want to be, this book is for you. 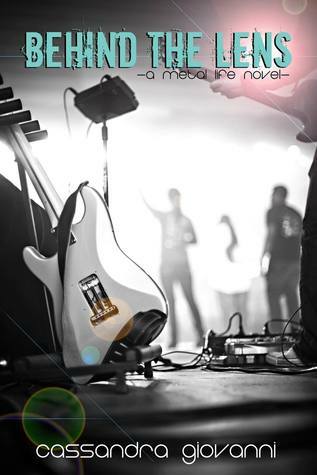 If you love stories about musicians and bands, this book is for you. If you love flawless writing, this book is for you. If you love a sweet love story, this book is for you. Natalie loves her life of photography and metal bands. She may get slack from many people for it, but when it's your passion, who can stop you? She has one simple rule, due to chaos of the past..."Never date anyone you work for." Touring with Makeshift Chemistry, Natalie finds herself in an all too familiar situation with a certain Brent Andrews. He's not your typical douchebag metal head, and I instantly fell in love with him. He wants nothing more then to get Natalie to break her rules, win her heart over, and let him in completely. The past has a way of creeping it's way in, but with the help of Brent and the band, can Natalie rid her demons once and for all? It's super cool to see them pull together as a family, and show Natalie they have her back, and they protect what's theirs. I’m not falling. I feel like I’ve landed. When he sings, parts of me shift back into place, and somehow, I feel like the holes in the fabric of who I am come together. Because ever since I met you, every day I’ve felt like I’m a better person – like I’m actually living my dream, when before I was just walking in someone else’s. Behind the Lens was a high angst, music based, melodrama/NA romance. I longed for a more balanced emotional tone but I found enjoyment in Ms. Giovanni’s observant and descriptive details of the various characters’ nervous mannerisms and behaviors. As excessive tension is just not my cup of tea, I was extremely impatient with Nat to find her voice, although I was entertained by Ms. Giovanni’s bantering band mates, as the levity was a welcome respite from the characters’ stresses. I was languishing and near despair but held out for that highly desired HEA. And I earned it. I practically salivate when I find out that Cassandra Giovanni has a new book. She's set my standard for great coming of age stories and has completely pulled me into the world of the boys of fallout. To me Behind the Lens is obviously an effort of passion and love for ones craft, reflecting Giovanni's love for photography and music. The story feels genuine and heartfelt, everything just flows and unfolds with great consideration. Our heroine Natalie has good cause to be guarded, and Brett, one I practically salivate when I find out that Cassandra Giovanni has a new book. She's set my standard for great coming of age stories and has completely pulled me into the world of the boys of fallout. To me Behind the Lens is obviously an effort of passion and love for ones craft, reflecting Giovanni's love for photography and music. The story feels genuine and heartfelt, everything just flows and unfolds with great consideration. Our heroine Natalie has good cause to be guarded, and Brett, one of her newest clients, gives her good reason to break her "don't date the client" rule. Beyond this being a fun read, as we see Brett and Natalie fall into each others lives and their quickly developing camaraderie, there's a sensual chemistry between them that comes through in their sweet banter and thoughtful conversations. The story line is well paced and we get the right amount of history to explain why Natalie feels the way she does. This is truly a story where the main character undergoes a transformation and comes to understand and accept herself. Natalie is already strong and level headed but she learns to allow herself to take back what's hers and face her past. A lot of this comes from her relationship with Makeshift Chemistry, she forms a connection with the entire band and I love how they have her back. Behind the Lens is a 5 star read about being true to oneself, finding ones voice and following the muse. I can't wait to see who gets the next story in this highly recommended series. I devoured Behind the Lens. The characters in the band were realistic. They were truly best friends who fought, argued, played, and laughed while traveling around the country and playing with music. Natalie has rules that she makes her self follow after getting burned with one of bands she traveled with. Brent has taken it upon himself to break all those rules but he is breaking them for the right reasons. The attraction between Natalie and Brent is undeniable. Yet, it takes some time for them t I devoured Behind the Lens. The characters in the band were realistic. They were truly best friends who fought, argued, played, and laughed while traveling around the country and playing with music. Natalie has rules that she makes her self follow after getting burned with one of bands she traveled with. Brent has taken it upon himself to break all those rules but he is breaking them for the right reasons. The attraction between Natalie and Brent is undeniable. Yet, it takes some time for them to admit it. I enjoyed that they didn’t quickly fall in love, fall in lust, or just fall. They worked through their relationship; they struggled to find a way to be together without pushing all the boundaries that Natalie set for herself. I also liked that Brent didn’t let her rules get in the way of them being together. He could tell when he should push her, when to comfort her, and when to just get out of her way. This is the second book in the Boys of Fallout series but each book is its own story. Each book is a different band member’s story. I definitely recommend picking them up and reading each one. 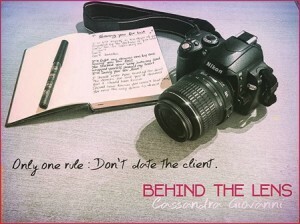 Behind the Lens by Cassandra Giovanni is the second book in her Boys of Fallout series. This focuses on another band managed by Fallout Records and a talented photographer, Natalie Scott, and the lead "screamer" in the band, Brent Andrews. Told from Natalie's POV we learn about her past relationship and the lasting scars it has left on her and her trust issues. She may be falling for Brent slowly but surely but she is determined to keep it completely professional and to never go through what she Behind the Lens by Cassandra Giovanni is the second book in her Boys of Fallout series. This focuses on another band managed by Fallout Records and a talented photographer, Natalie Scott, and the lead "screamer" in the band, Brent Andrews. Told from Natalie's POV we learn about her past relationship and the lasting scars it has left on her and her trust issues. She may be falling for Brent slowly but surely but she is determined to keep it completely professional and to never go through what she went through with her last band boyfriend, Jace Smith. Brent is steadily falling for the bands photographer. The shots she takes are amazing - they capture everything and more about their time on stage, the audiences involvement and emotion while they're playing, and the backstage moments that capture just how much of a cohesive unit they are. When he learns the extent of the issues Natalie had with Jace, the band takes matters into their own hands and take back Natalie's power. Natalie is a 'free lance' band photographer, that is, she travels with bands and photographs their lives on tour. She has a bad history from dating a member of a former client and now has a hard and fast rule about never dating clients. She is now on tour with a new band, Makeshift Chemistry, and is fighting the chemistry with one of the band members. Brent, is one of the band's vocalists aka the Screamer, and Natalie's unofficial 'tour guide'....he is also intrigued by her. While the rest of th Natalie is a 'free lance' band photographer, that is, she travels with bands and photographs their lives on tour. She has a bad history from dating a member of a former client and now has a hard and fast rule about never dating clients. She is now on tour with a new band, Makeshift Chemistry, and is fighting the chemistry with one of the band members. Brent, is one of the band's vocalists aka the Screamer, and Natalie's unofficial 'tour guide'....he is also intrigued by her. While the rest of the band members treat Natalie as one of the guys, including her in their taunts, teasing and fights, Brent is always patient and protective. He admires Natalie's work but is determined to discover the reason behind her aloofness. When Brent and band mates finally discover the reason for Natalie's 'rule', they take it upon themselves to get justice for Natalie. Will Brent and Natalie find their HEA if the guys can get her some justice from her ex? I love the camaraderie between the band members and Natalie, and that the relationship between Nat and Brent was a slow burn. The story was well written and kept my interest. IMO, this was better than book 1...and I really liked that one as well. Narrator did a great job. 3.5 Stars. My first book by this author and I enjoyed it. I definitely like a good rockstar story. Natalie lands a new job for the band Makeshift Chemistry. She immediately has a connection with Brent Andrews but she has already been there done that! She’s learned her lesson and now her one rule is not to get involved with anyone in a gig. She’s already been burned before and she’s not going down that road again. But Brent is determined. He can’t deny the strong attraction between them. Can he c 3.5 Stars. My first book by this author and I enjoyed it. I definitely like a good rockstar story. Natalie lands a new job for the band Makeshift Chemistry. She immediately has a connection with Brent Andrews but she has already been there done that! She’s learned her lesson and now her one rule is not to get involved with anyone in a gig. She’s already been burned before and she’s not going down that road again. But Brent is determined. He can’t deny the strong attraction between them. Can he convince her that he’s nothing like her ex rockstar boyfriend. 21 year old Natalie Scott is living the her dream. She's working as a photographer for bands touring around states, capturing their exciting tour-life. Natalie has rules, one she especially vows to never break again especially after getting burned with one of the bands she previously travelled with. Brent has taken it upon himself to break all those rules but he is breaking them for the right reasons. The attraction between Natalie and Brent is undeniable. Yet, it takes some time for them to admit 21 year old Natalie Scott is living the her dream. The attraction between Natalie and Brent is undeniable. Yet, it takes some time for them to admit it. The characters of the band are realistic. They are best friends who fight, argue, play around, and have a laugh with while travelling around the country and creating bea-u-tiful music. Each book is a different band member’s story. I reviewed the first book in the series, Out of Beat, and I was SO excited when the author asked me to review the others! Cassandra Giovanni is an amazing author who weaves an amazing storyline. Natalie is a fiercely independent character who can't stand being in one place for too long. Brent is a swoon worthy screamer in a band she's photographing on tour. I binge read this book in an afternoon, that's how good it is! You guys do not want to miss this series! The struggles someone has to overcome after a bad breakup varies depending on the people themselves. In this books case it was definitely something that took a while as well as someone special to make it past that and see a future with someone else. I loved watching the feelings bloom between these two and this book definitely had a perfect ending. Natalie has a job most people would kill for. Doing something they love daily. Also, any young woman would kill to be around all that hotness. Hanging out with hot rockers in a tour bus. Yum! The trials she has faced made her an amazing character in this book. I highly recommend this series. I enjoyed this title but found it a bit anticlimactic. I read the first book in this series and really liked it and I'm glad I continued on with the series. This book is entertaining and the characters are fun. The book doesn't have sexually content, but it does have chemistry. My only complaint in the language, the swearing is horrible and annoying. It adds nothing to the story. I hope this series continues, though this book didn't set up another like the first book did.